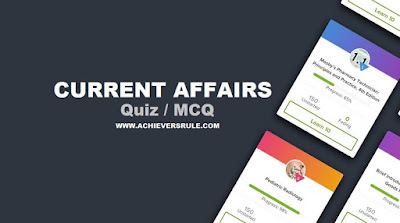 Daily Current Affairs Quiz - 8th May 2018 contains a list of 15 questions which are important for the upcoming examinations of Bank like IBPS PO, IBPS CLERK, SSC CGL, SSC CHSL and other similar examinations. These are based on the latest pattern of the current examinations. Each question have been provided with a proper explanation and answer. Aspirants can go through the Current Affairs Updates before going through the Daily Current Affairs Quiz. Q1. Vladimir Putin has been sworn in as the president for the _________ term. Q2. Who is the Shanghai Cooperation Organisation Secretary ? Shanghai Cooperation Organisation Secretary -General Rashid Kutbiddinovitch Alimov arrived to hold talks with External Affairs Minister Sushma Swaraj and other Union ministers. Q3. How many Marine Observation System is going to come up along the coast of India? India will establish a Marine Observation System Along the Indian Coast (Mosaic). At least six observatories – three along the east coast and and an equal number along the west coast – will be established. Q4. Hindustan Petroleum Corp Ltd has launched home-delivery of diesel in which state? After IOC, state-owned Hindustan Petroleum Corp Ltd (HPCL) has launched home-delivery of diesel in Mumbai and has plans to expand it to other parts of the country. Q5. NITI Aayog is collaborating with which company to develop Precision Agriculture Over Artificial Intelligence? Q6. which organization has developed an atomic clock that will be used in navigation satellites to measure precise location data? Q7. The military exercise 'Harimau Shakti' was conducted between India and which country? The second phase of the Indian and Malaysian armies' joint military exercise 'Harimau Shakti' was initiated on Monday. Q8. Cochlear Implant Awareness Programme is being organized in which state? Q10. Ajeevika and Kaushal Vikas Mela is going to be held in which state? Q11. which state is organizing the 7th National Children's Theatre Festival ? Q12. Who won the Abu Dhabi Open at Professional Squash Association Tour in Dubai? India's Ramit Tandon on Sunday toppled number one seed Omar Abdel Meguid of Egypt to win the Abu Dhabi Open, his third title on the Professional Squash Association (PSA) tour. Q13. What is India's rank according to the Lowy Institute Asia-Pacific on power index? Q14. which country withdrew on the United Nations Security Council in 2019-20.? Israel withdrew from a race against Germany and Belgium for two seats on the United Nations Security Council in 2019-20. Q15. which country will host the 15th Asia Media Summit?